Woodworking can be an incredibly fulfilling hobby. It allows you to work with your hands and create things on your own, instilling a sense of pride in your work that not all hobbies can match. Getting started with a woodworking hobby may seem a bit daunting at first, especially when you think about the cost of various pieces of woodworking equipment. Fortunately, it’s entirely possible to start small and build up to bigger things as your skills and budget allow. Construction/Building: This is probably the most common type of woodworking, where you take lumber or other wood and actually build something out of it. From birdhouses to backyard furniture, you can build it all. Turning: Turning is the art of using a lathe and slowly stripping away bits of spinning wood to create something beautiful. Turned wood can be art unto itself, or it can be components of a larger building project. Carving: Carving is another common type of woodworking, typically using hand tools to create designs and shape the wood to your liking. Those wanting a hands-on hobby are often most attracted to carving. Upcycling: Upcycling uses “found wood” and creates new and beautiful things with it. This could be as simple as finding new uses for broken palettes or as complex as working driftwood to make beautiful furniture. Obviously, this isn’t an expansive list. Your interests may overlap categories or may not be expressly mentioned here. These are just a few suggestions to get you started. When buying tools, some people just go out and buy everything that they can think of related to woodworking. In the interest of your budget, though, it’s important to use some restraint. Do some research and see what the most common tools needed for the type of work you want to start with is, then look at some beginners’ projects and see which of these tools are actually used. When you do buy, you also might want to stay away from top-of-the-line purchases at first until you’re sure that you actually enjoy the woodworking that you’re doing. If you have a maker space or other communal handiwork group in your area, this may be another viable option to get started. See if they have public tools available for rent so that you can get a feel for them before you buy your own. You may also find some valuable instruction and insight from other woodworkers in your area. If you plan on working at home, you’re going to need a space in which to work. Whether it’s part of a garage, a basement or a standalone building, you’ll need some sort of workspace with enough room to get around and move the wood you’re working on. 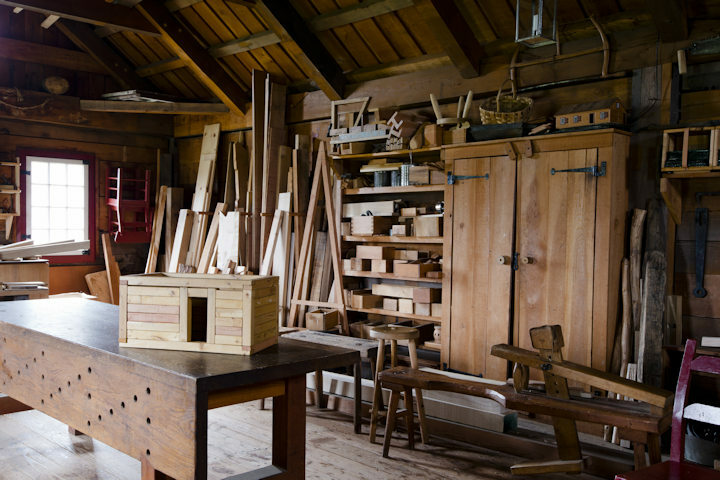 At the very least you need a secure space for your tools, a dry area to store your wood and enough room to work without knocking things over or having to take safety risks. You should have at least one table in the work area, several clamps, and essentials such as wood glue, hammers, tape measures, speed squares and other basic tools beyond what you use for woodworking. A shop vac is also essential since woodworking often produces a lot of sawdust. If you have room, you should set up the location in a way that you can come back to it when you need it and leave work out to dry or set without being disturbed. If you only have a temporary workspace set up then you’ll still need storage space for all of your equipment and a secure area where you can leave work to dry or cure. The type of wood you use depends on the work that you do. There are a lot of considerations when choosing wood, including the type of finish you’ll use (paint, stain or varnish), whether the final piece will be indoors or outdoors and what the piece will be used for. As you become more experienced, these are topics that you should really look into to help you match the right wood to each project you do. Fortunately, this isn’t nearly as much of a concern when you’re just starting out. While you’re still learning, you can often get away with using whichever woods you can get at a good price which will meet your needs. If working on a project that has specific woods named in its instructions, use those woods for best results. Once you’re set up and ready to start working, it’s important to reign in your ambition while you’re still learning. Choosing complex projects to start with greatly increase your chances of doing something wrong and possibly being injured. Choose simple, easy-to-follow projects that have been written up with clear instructions to start with as a way to learn your tools and how to use them safely. Starting small also gives you a chance to get the basics of workshop safety down. Even for very simple projects, you should wear eye and hand protection, and hearing protection if using any power tools. As you move on to more complex projects, these safety habits will be ingrained in you and you’ll never even think of putting yourself at risk in the wood shop.